It’s always the small things you miss most when traveling. Mealtime independence (and people always respond “poor you, having to eat out three times a day”. But REALLY people, I like scrambling my own eggs and eating cold leftovers for breakfast sometimes!). Having reliable wifi in the bathroom so I can check Facebook while…brushing my teeth. Being able to flush toilet paper directly down the pipes instead of depositing it in the trashcan next to you. Cheese. I came home craving every trendy healthy thing in New York, aka things in bowls. Healthy grain bowls, veggie soup bowls, fruit-adorned breakfasts in bowls, tahini-y mushy eggplant in a bowl, lots of brown rice and Asian flavors and roasted veggies and toasted seeds and crunchy raw vegetables and pickled things, preferably in bowls. I am a walking stereotype of instagrammable food culture. #sorrynotsorry. Since my NYC return, I’ve met up with many friends who have greeted me with, “Looks like you ate so well on your trip!” I look at them, confused, wondering where they gleaned this information. Because, yes, I literally don’t know how to Not eat well (and by well right now I really just mean plentifully), but I wouldn’t say my time in Guatemala was the epitome of this. They respond that my Instagram food pictures looked amazing (which I just attribute to the beautiful woven tablecloths that adorned every table), what great vegetarian options there were, etc. What they don’t know is that Every Meal I Didn’t Post on Instagram consisted of corn tortillas, overscrambled eggs, mayo-y boiled vegetables, and bean mush. Hence my excitement in returning to the world of Extreme Bowl Culture. And hence this very simple lunch I’ve been dreaming about since approximately one week into my trip, or you know, since before Thanksgiving. 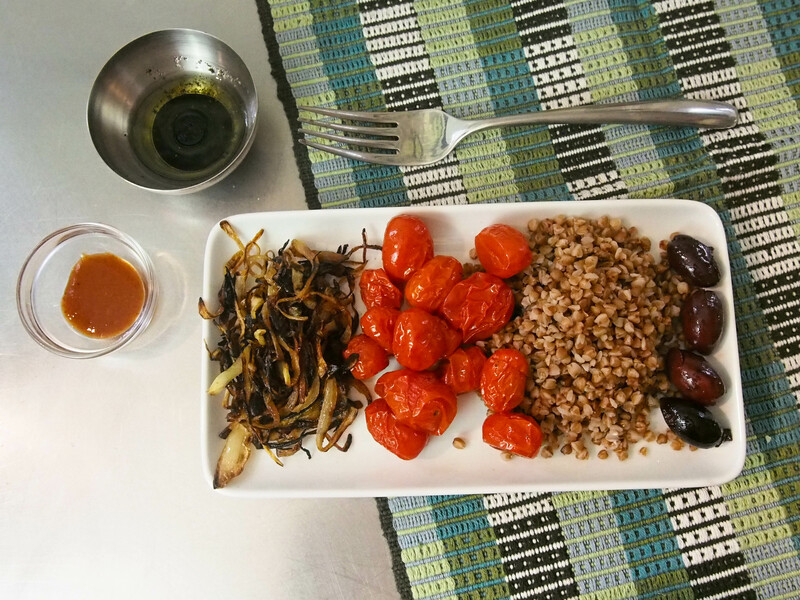 This meal riffs on a snack I used to assemble for lunch during long shifts at Bakeri, comprised of easy ingredients we always had prepped. I bought my kasha at a Polish deli for very cheap, but I’m sure you can find it in the bulk section at any health store. 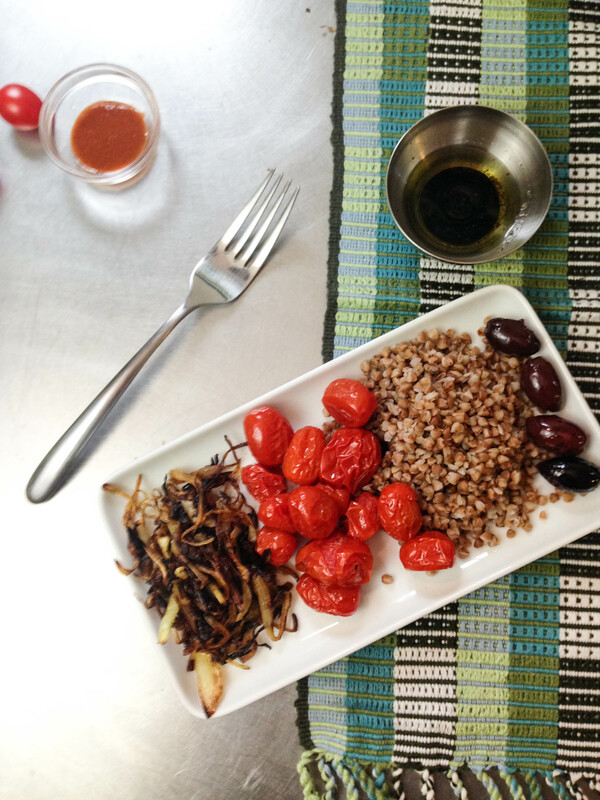 Kasha is a fancy name for toasted buckwheat, which it’s a bit nuttier than the untoasted variety. Kasha is brown; if it hasn’t been toasted yet it will be green. You can assemble everything beforehand; the salad is just as good warm as it is at room temp. Feel free to add parmesan or feta to de-veganize this. A handful of baby salad greens would also be a nice addition. To make buckwheat: Bring water to a boil. Add kasha. Simmer for about 10 minutes, or until tender. Strain. 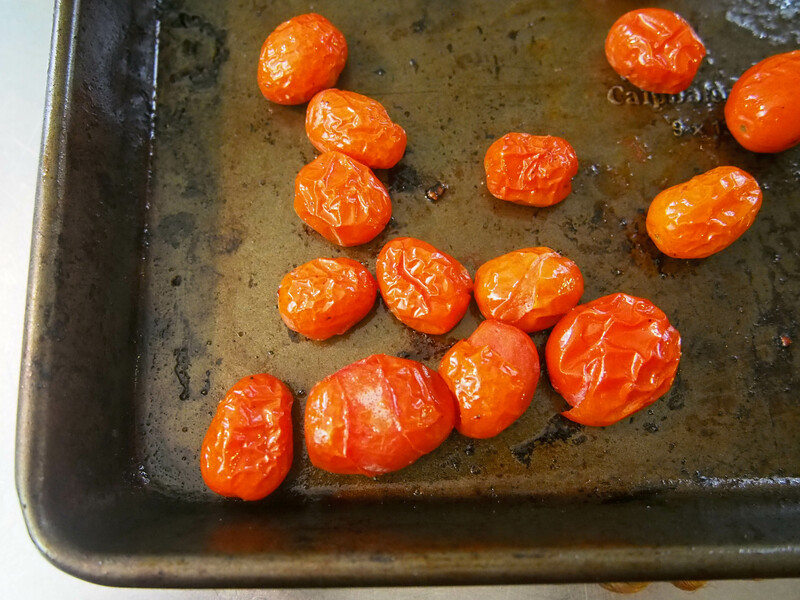 To roast tomatoes: Preheat oven to 400 degrees. 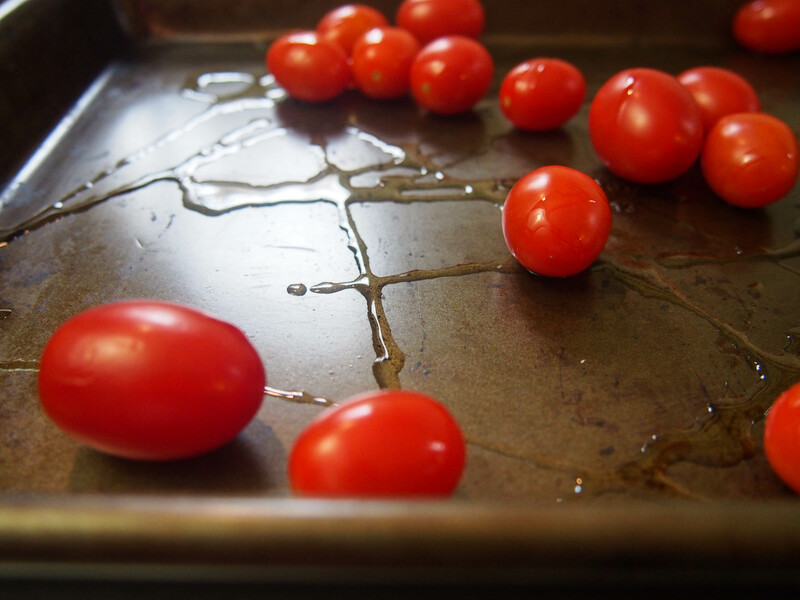 Place tomatoes on a baking pan and cover with a healthy drizzle of olive oil, plus s&p. Roast for 12 minutes, stirring halfway through. 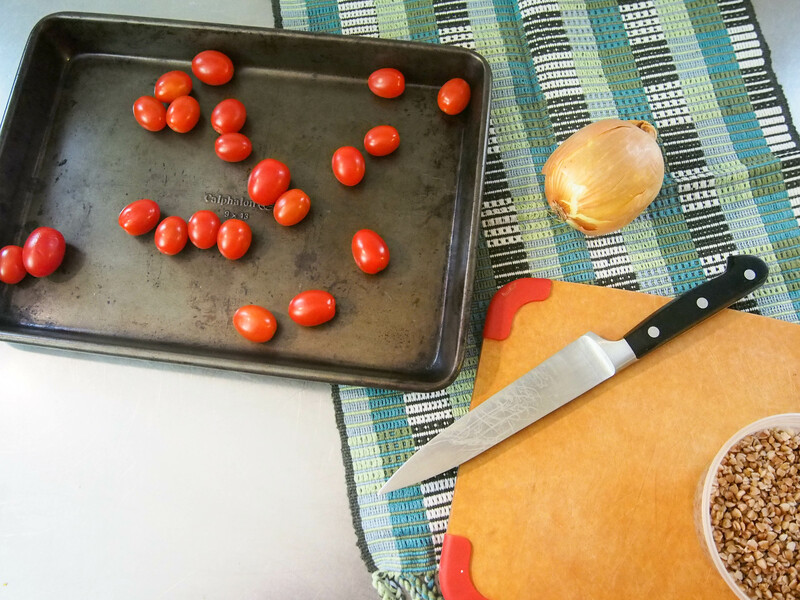 Tomatoes will be crinkly, puckered, juicy, and blistered when done. Mmm. 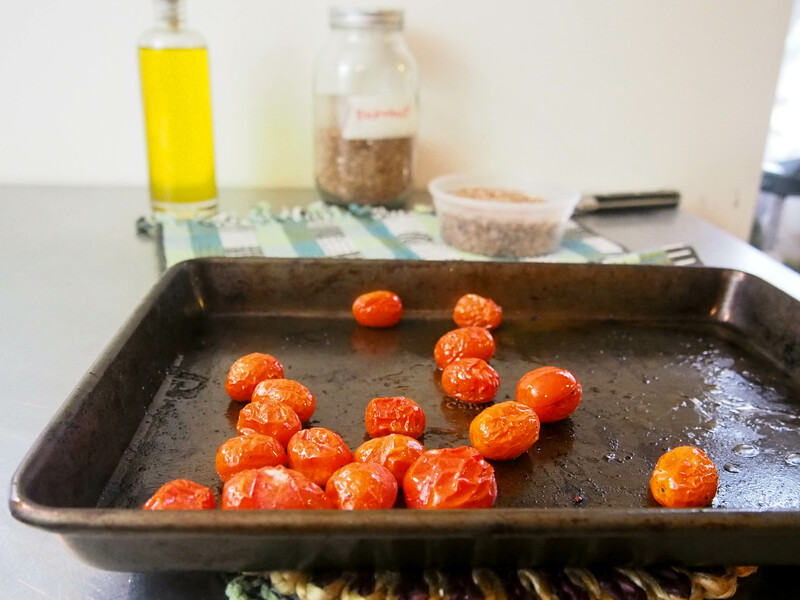 To assemble: Mix together about ½ cup cooked kasha (or more) (or less), cooked tomatoes, caramelized onions, and olives in a BOWL (or a platter first cause it’s pretty). Mix together about 1 tablespoon olive oil and the balsamic vinegar; season with salt and pepper. Pour dressing over salad. Add hot sauce if you want a kick. Commence eating. 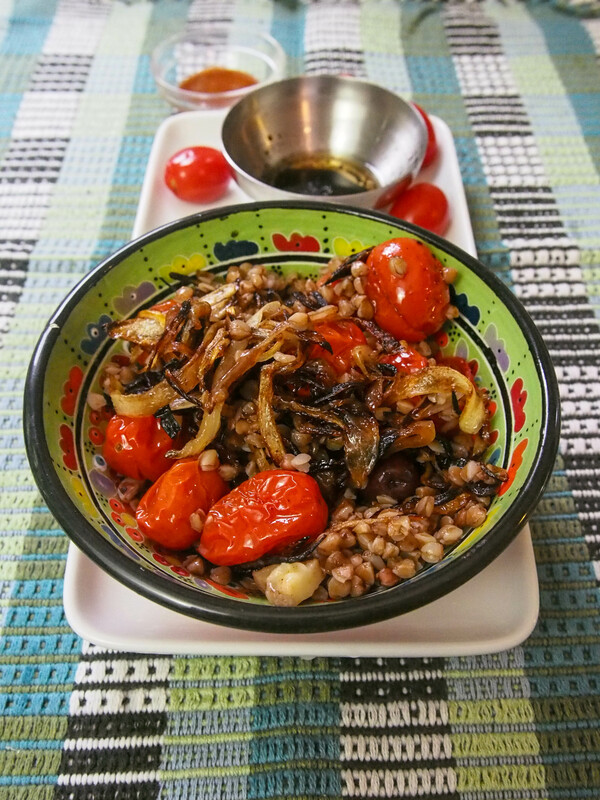 This entry was tagged bowl, buckwheat, gluten free, healthy, inspired by, kasha, lunch, olives, onion, recipe, salad, swanky original, tomato, travel, vegan, vegetarian, winter. Bookmark the permalink. someday I will perfect the onion technique… but they still turn out pretty dang good!